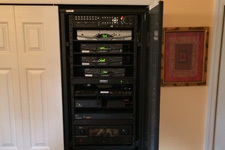 "Cinemagic Entertainment came via a referral' and was very quickly able to assess the best option for a comprehensive wireless entertainment system throughout our home that met our needs and budget. They even went out of his way to replace equipment on a separate day that to enhance the quality of the home network' which was a problem caused primarily by the service provider. I would recommend Cinemagic Entertainment in a heartbeat. 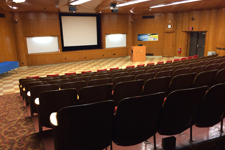 Thanks to Cinemagic, we were able to get a terrific entertainment system that met our needs. Crystal clear LCD picture, movies in life –like surround sound and incredible music selection and sound throughout the house and on our deck. We loved the in-home shopping experience and customer service. 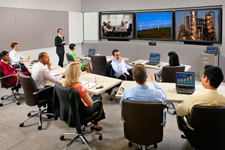 Cinemagic is hands on and customer focused. They listen to their customers and then supply and install great equipment. I wanted to thank you again for the great job you and your associates did with the installation of our new entertainment system. Not only was the installation itself top notch, but the time and care you took to explain everything and your follow up has been exceptional. We are very pleased with everything and can't wait to get going on the next project. 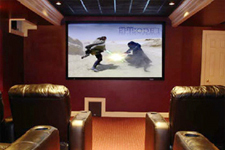 "The professionals at Cinemagic will help you understand the systems available and how each can benefits you. They work with you from start to finish, helping you understand the different technologies, to communicating your plans with the architect, interior designer, and builder, as well as installing the electronic equipment and training you to use your new system and its components. They have been here for me even well after the installation is completed. 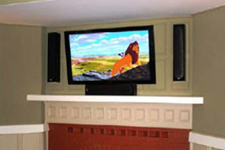 Cinemagic is my number one source for audio and video home entertainment systems." "We hired Patrick to install a new home theatre system and sound system throughout our home and we are very pleased with the end results. Throughout the process we received nothing but the best service, professionalism and advice. Patrick and the installation crew were extremely responsive to our questions and follow-up in a very timely manner. Where possible, they made use of existing equipment and never attempted to over-sell us on any of the equipment we purchased. I would certainly recommend him and use them again for future needs." "Just a quick note to say how please we are with the Home Theater you designed and installed for us. We inaugurated the system by watching War of the Worlds. The quality of the picture and sound system simply blew us away. It really makes watching movies fun. The picture is so good we literally had friends invite themselves to our house to watch the Super bowl in high definition on our system. 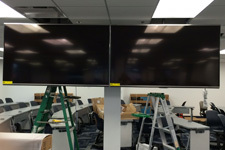 Your equipment selections were absolutely spot-on and the installation team was polite and easy to work with. Best of all… everything works!" "A great big Thank You to Patrick and his team for a job Well Done! You were great to work with from beginning to end. I tried to cut corners rather than follow your advise and it didn't work. 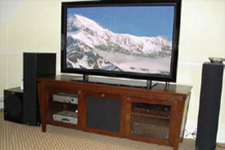 My Husband and family are truly enjoying our new entertainment center and the picture and sound setup are AWESOME!" 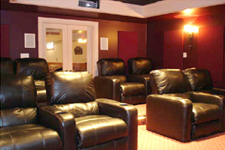 "I just wanted to take this opportunity to thank you for all of your efforts in installing my new home theatre system. Despite encountering unforeseen challenges and requiring multiple visits, I appreciate your honoring the agreed upon price. 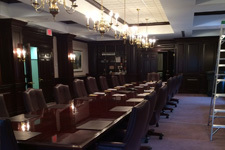 Your knowledge in designing a system within my budget and attention to customer satisfaction is very much appreciated". "It's been over a month that you have came to our house to install the entertainment system and we don't want to miss the opportunity to thank you for your excellent job. We feel very happy about choosing you and we will be glad to refer future customers whenever we have the chance. "I recently participated in the Saddle River Designer Show House and had the good fortune of working with Patrick and Cinemagic Entertainment. Cinemagic donated all of the A/V equipment for our room in the show and Patrick did an unparalleled job of project managing this installation on a very tight deadline. He was always amenable to work with our various tradesmen to ensure our project was completed on time. Patrick was a pleasure to work with and all of his workers were the utmost professionals. We are sure to be working with them again in the future and can recommend them with confidence to anyone.